The South Carolina Barrier Islands are well-known for the long stretches of sandy beaches. While you can spend your days frolicking in the water, tanning on the beach, or fishing off of the pier, summers on the island give visitors a unique opportunity. When sea turtles on Isle of Palms hatch and make their way to the ocean, licensed groups of people help this dwindling species along the journey. Thanks to the Turtle Team, you can be a part of this crucial coastal conservation effort! If you want to find more things to do and places to see in the Isle of Palms and Charleston areas, request our free Vacation Guide! When and Where Can You Find Sea Turtles on IOP? Sea Turtle nesting occurs on Isle of Palms between May and mid-August. During this period, female loggerhead turtles trudge up the sandy shoreline to the edge of the dunes around the island. The main concentration of nests typically concentrates around the northern end of IOP due to the beach restoration project in the late 2000s. Once the turtles build a nest and deposit an average of 120 eggs, they bury them and head back out to see. As the baby sea turtles hatch on Isle of Palms, they emerge from the nest at night and make their way to the ocean. This is a beautiful phenomenon that sometimes occurs during the day. The Isle of Palms Turtle Team helps identify and mark nests before the hatchlings make their trek to the water. Once the sea turtles begin to hatch, they assist them in getting from the sand to the water safely to prevent seagulls and other ocean birds from catching them. You can contact the Turtle Team to find out when and where they will be on certain days during the summer so you can watch, learn, and maybe even assist in the rescue effort! Find sea turtles on Isle of Palms isn’t the only fun way to experience nature in the South Carolina Barrier Islands. Barrier Island Eco Tours and Coastal Expeditions provide a variety of ways to see local wildlife, explore small islands and marshes only accessible by boat or kayak, and partake in fun activities like stand up paddleboarding. These tours are fantastic ways to try something new and fun for the whole family! After you help save some sea turtles on Isle of Palms, head out to one of the nearby creekside bridges or piers on Mount Pleasant to try your luck at crabbing! Just grab some crabbing equipment from a local outdoors store, but some bait, and throw your net out into a slow or steady moving stream! Kids and adults will love trying this coastal activity! If you want to stay close to the nesting action on the beach, East Islands Rentals has the perfect vacation home for you! We offer an extensive list of oceanfront rentals that feature beautiful, sweeping views of the beach up and down the shoreline. 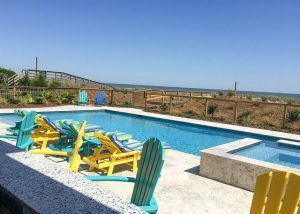 You can sit in your rocking chair on the porch while sipping your favorite cold drink and enjoying a good book as the ocean breeze balances out the warm sun. You are in paradise on IOP! Explore all of the things to do in the area and check out all of the special accommodations that our guest services provide! Ready to plan the perfect beach vacation? Book one of our top-notch properties today! We look forward to welcoming you to IOP!